No, this isn’t a weight-loss challenge– it’s a running mobility challenge. I’m a big fan of a lot of the ideas that come out of the U.K.-based Kinetic Revolution group as they seem to emphasize the same core principles that enlightened physical therapists recommend for their clients. Last night, I signed up for their 30-day challenge, which promises to make me a stronger, healthier runner and only takes 15-20 minutes a day of light exercise before running. Heck, I can do that! 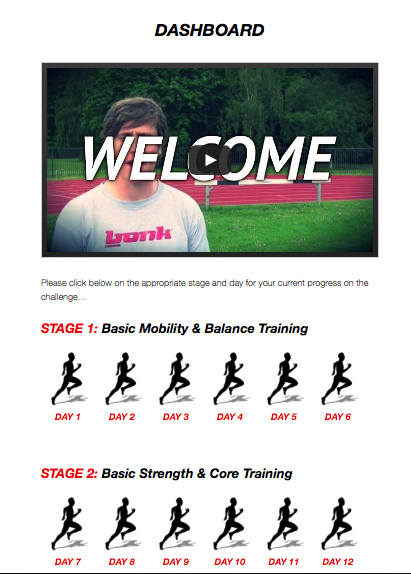 If you’re interested in joining me in getting stronger and faster, join me after the break. You’ll need to give over your email address for this one. Then, they’ll send you a verification message. Once you get that and click on the link included, you’re in. First thing you’ll see is the Dashboard , which gives you an explanatory video to start you off and then links to what you’re supposed to be doing each day for 30-days. The idea isn’t to turn you into a running Adonis by the end of thirty days. Instead, it’s to build the key strength you’ll need through a well-rounded set of exercises. I suppose once you’ve hit the end of the 30-day challenge, you can just start all over again and repeat 30-day cycles all year round. Or, you could just choose key exercises and work on those. I kind of like the first option– particularly if I can download it and play it on my iPhone. It’s a 30-day program, after all, so miracles won’t happen until day 29. Then suddenly the clouds will part and God will personally smile down on you. Or you might noticed your running is a bit better. I’ll post my thoughts on the program as I go along.